A solid board game that improves on Kill Doctor Lucky. Where Kill Doctor Lucky inverted the Clue formula to make a pre-murder game, Save Doctor Lucky inverts the inversion to make a game where you are trying to save the eponymous Dr. Lucky from going down with the Titanic, or a ship of equal value. This is a boxed Cheapass game, which means that you are expected to provide some extra pieces yourself. What you get in the box is a game board in 8 pieces, printed in black on blue cardstock, 90 cards printed in black on glossy white cardstock and a rulebook. You need to provide one pawn for each player and another easily distinguishable pawn to represent Dr. Lucky. The components in Save Doctor Lucky are slightly higher quality than those in the original release of Kill Dr. Lucky. 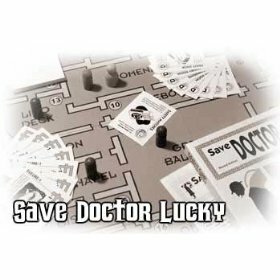 Save Doctor Lucky game has never been re-released in a fancier edition. There are twenty four Aid cards, representing an item that you can use to save Dr. Lucky from the briny deep, ranging from Thick Gloves to Shark Spray.There are twenty eight Move/Room cards that allow you to move yourself or Dr. Lucky around the ship. There are twenty eight Failure cards that players can use to stop attempts to save Dr. Lucky. All of the cards feature amusing pieces of trivia about the ship, except for the two-pt failure cards which feature a logic puzzle in ten parts. An expansion, Save Doctor Lucky on Moon Base Copernicus, includes a new map. The Doctor Lucky Ambivalence Pack features a double-sided map with a non-sinking ship on one side for Kill Doctor Lucky and a burning hotel on the other side for Save Doctor Lucky. 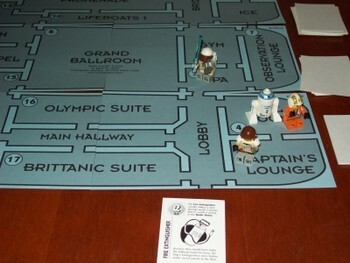 The aim of the game is for a player to move around the ship and attempt to save Dr. Lucky in a location where at least one other player can see them making the attempt. The ship is divided into twenty three numbered rooms and eight un-numbered rooms spread over four decks (A-D). The numbered rooms represent Dr. Lucky’s path through the ship. To begin, cards are dealt to each player in turn until they receive a Room/Move card which determines their starting point on the map. The first player to receive a Room/Move card goes first. Further cards are dealt to determine Dr. Lucky’s starting room. The deck is reshuffled and six cards are dealt to each player. The remainder of the deck is split into four roughly equal stacks. Normal play proceeds around the table to the left of the starting player. Each turn, a player can take a “Snoop” turn or an “Active” turn. Other games you might enjoy! On a “Snoop” turn, a player moves their pawn one room in any direction and takes a card from the stack next to the lowest deck (starting with D). On an “Active” turn, a player can move one room in any direction and play any number of Room/Move cards to move themselves or Dr. Lucky. To end their turn, they can make a save attempt if they are in the same room as Dr. Lucky and at least one other player has a direct, perpendicular line-of-sight view into that room. A save attempt is worth one point unaided, or the value on an Aid card if one is played. Some Aid cards are worth more points in certain locations. Proceeding from the saving player’s left, the other players can foil the save attempt by playing failure cards equal to the value of the save. Only the player to the direct right of the saving player is required to attempt to play failure cards. If the save succeeds, the player wins, otherwise play continues with the next player. All cards are discarded. After each turn, Dr. Lucky moves to the next highest-numbered room on his path. If he lands on a player’s pawn, then that player takes the next move, regardless of the normal sequence. The turn sequence continues to that player’s left, so it is possible to end up having your turn skipped. When the stack of cards next to a deck is exhausted, then that deck “sinks” and the two map pieces for that deck are removed from the table. Any pawns on the sinking deck move to the lowest numbered room on the deck above. If every deck sinks with no winner, then the game ends in a draw. Whereas the strategy in “Kill Doctor Lucky” usually leads players to scatter to different parts of the board, “Save Doctor Lucky” leads to more bunching. It’s a tricky balance, because you don’t want to enable other players to make save attempts, but you want them to be able to see you so that you can make your own attempts. Aggressive play will force Failure cards out of the hands of other players, but may also clear the way for another player to benefit. Smart use of the move cards is essential. It’s usually worth the trouble to use an Aid card in a room where you receive a bonus, as these can be substantial. The shrinking board forces players into closer proximity as the game proceeds, making it easier to make save attempts and increasing the pace of the end game. This is in contrast to Kill Dr Lucky, where the mansion sometimes seemed too big. The made-up trivia on the cards is amusing and the production values overall are relatively high for a Cheapass game. Remembering to move Dr. Lucky after every turn takes some getting used to, especially after the lower decks have started sinking. It feels much more like a real game than some of the other Cheapass games, which makes it an easier sell to non-gamers. The flip side of this is that it doesn’t encourage quite as much silliness as other Cheapass games. I feel bad for Save Dr. Lucky. It’s a better game than Kill Dr. Lucky, but it has never received the cult status and lavish updates of its elder sibling. I suppose it’s easier to get people excited about killing an old man than about saving him. There are enough differences to the Kill Doctor Lucky formula and gameplay refinements for Save Doctor Lucky to stand apart. It’s definitely worth a spot in your rotation, even if you’re not a fan of the original.